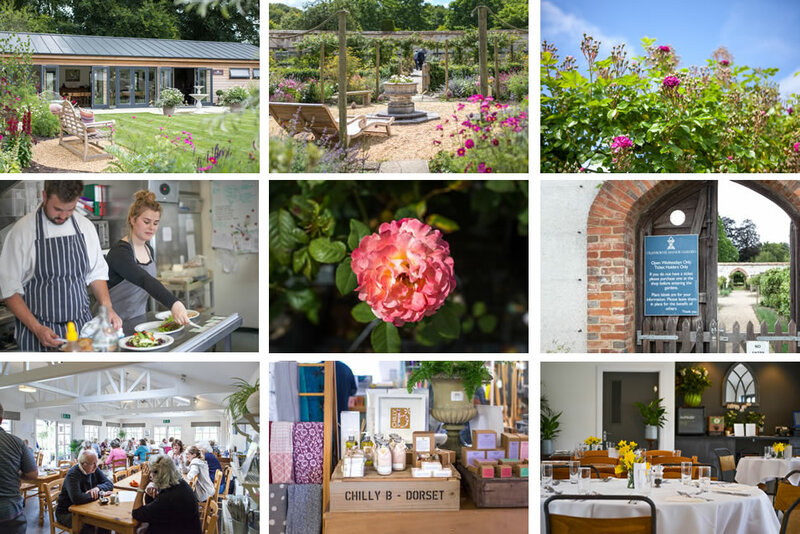 Cranborne Garden Centre is set in the walled, former kitchen garden of Cranborne Manor in beautiful Dorset countryside. We specialise in roses and stock a wide range of shrubs, trees, climbers, herbaceous and bedding plants, pots, stoneware and gardenalia. Our GIFT SHOP has a wide range of interesting homewares and gifts along with locally produced foods and the VINTAGE BARN is a treasure trove with an eclectic selection of broccante. THE CAFÉ serves breakfast, lunch, cream teas and a tempting selection of homemade cakes - everything is made in our own kitchen using local produce. We run special events throughout the year including talks and workshops, live music events and fairs - keep an eye on the website and our programmes of events. Cranborne Manor Garden is open every Wednesday 9am-5pm (last entry 4pm). Tuesday 30th April, 7.30pm: 'Honeybees, bumblebees & solitary bees - their differences & the roles they play in pollinating different flowering plants' by Brigit Strawbridge. Supper available in The Café before the talk (booking essential). 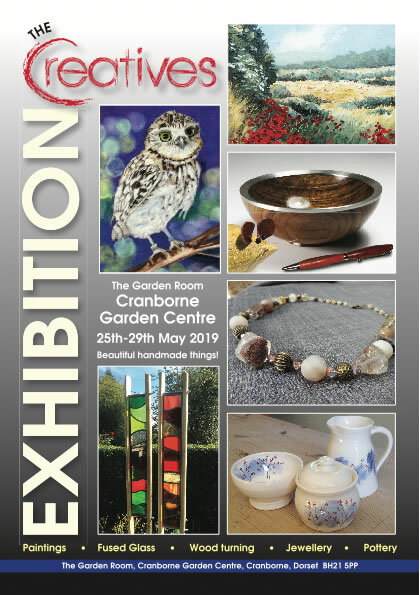 Local artists and crafts people exhibiting and selling their work in The Garden Room. 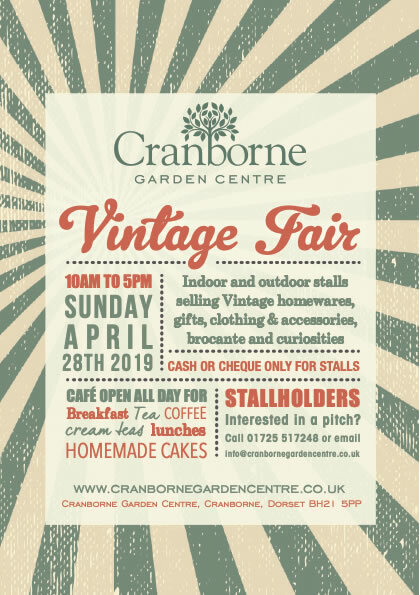 Indoor and outdoor stalls selling Vintage homewares, gifts, clothing & accessories, brocante and curiosities. Café open all day for breakfast, tea, coffee, cream teas, lunches and homemade cakes. The Boutique in a Bus is at Cranborne Garden Centre on the last Saturday of every month. Our events building, THE GARDEN ROOM and its private garden is available during the day or in the evening for all private functions including parties (both small, intimate gatherings or large groups), wakes, conference/training/meeting facilities. We have a wide range of catering options available to suit all tastes and budgets. We are fully licenced and have a premises licence for music and dancing. We have launched an exciting new range of seeds selected by our gardeners and specially packaged for us. Our range includes a wide selection of annuals, perennials, vegetables and herb seeds, many of which are heritage varieties. Cranborne Garden Centre has specialised in old-fashioned and modern roses for over 30 years, and we stock over 350 varieties. 70% off last season's roses whilst stocks last. We specialise in herbaceous plants and stock a large and interesting selection including many varieties which can be difficult to find elsewhere. We also stock a wide range of shrubs, trees and bedding plants. We have an interesting selection of pots and containers, arbours, arches and gardenalia. The Garden Centre is also the only supplier of Haddonstone stoneware in Dorset. 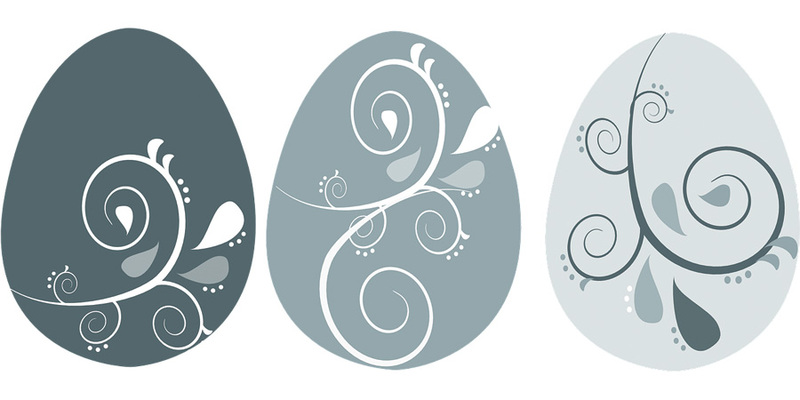 A range of items in stock, plus any item can be ordered. Everything you need for your garden - we stock a comprehensive selection of tools & gloves, garden sundries, plant supports & trellis, compost, etc. We stock a wide range of environmentally friendly products. All members of our garden team are horticulturally trained and are on hand to offer their advice and expertise daily. The café is open daily offering breakfast, coffee and tea, homemade cakes and cream teas and a selection of hot and cold lunch dishes. We offer a range of gluten free and vegan options. Sandwiches served until 4.30pm daily. Coffee, tea, homemade cakes, cream teas served all day. AFTERNOON TEA - a selection of sandwiches, scone, clotted cream and jam, homemade cakes and a pot of tea £12.50 per head (children under 12 £8.50). Add a single serve bottle of prosecco £6.50. Booking essential for Afternoon Tea: 01725 517248. All our food is freshly prepared at the Garden Centre and we use local produce including meat from Cobley Wood Farm, bread from Orchard Bay Bakery and seasonal vegetables grown in our own kitchen garden. We serve a selection of wines, prosecco, Cranborne Chase Cider and ales from Sixpenny Handley Brewery. The Gift Shop is the perfect place to find beautiful gifts for friends and family along with lovely homewares and foodie treats. We host wedding ceremonies and receptions in The Garden Room. 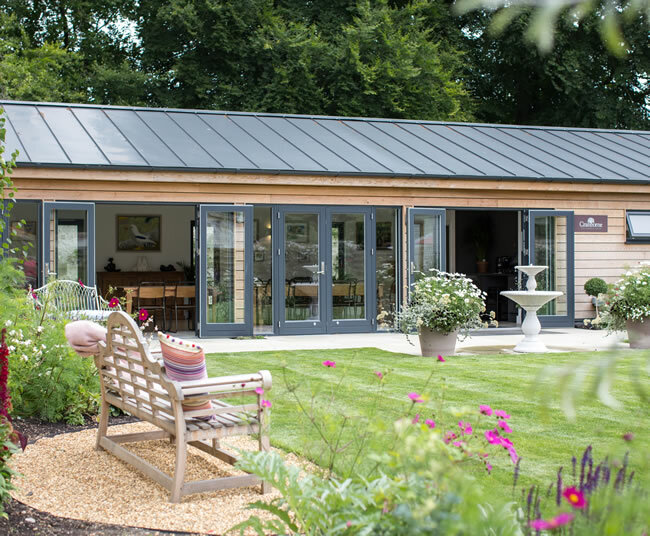 The Garden Room is nestled in a private and secluded corner of the walled garden with direct access from our large car park. Bespoke options and packages available. For more information and to arrange a viewing, please contact Claire Whitehead weddings@TheGardenRoomAtCranborne.co.uk or 01725 517248. 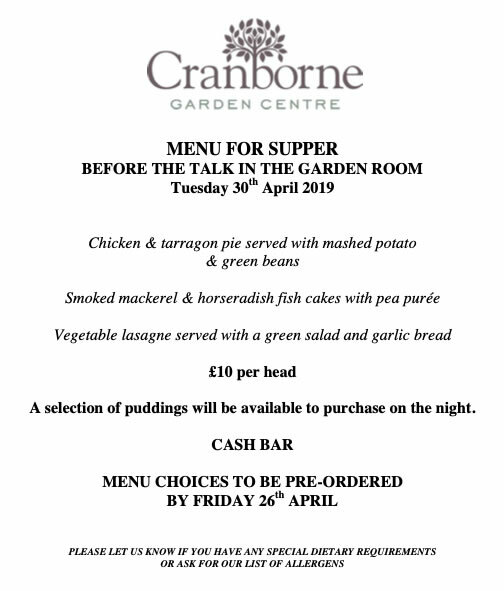 See www.thegardenroomatcranborne.co.uk for full information. Cranborne Manor Garden is open every Wednesday until 10th October 9am - 5pm (last entry 4pm). Tickets available from our Gift Shop - £6/£5 concessions/£1 children. Monday mornings, 10.30 - 12 noon. For more information please contact Caroline Wilkinson: cj@wilkinsonyoga.co.uk or 01725 552209. Booking essential. I just wanted to say that when my husband and I visited Cranborne Garden Centre we were really impressed with the choice of plants and gifts and bought some lovely goodies for our garden! We also had a lovely lunch (and cake) in the Garden Room and were really impressed not only with the food and local cider, but also the staff on duty - we will definitely be returning. A.H.
A fantastic display of plants. Lovely gift shop. We stopped off for some plants and to have some food. The food was delicious and a huge portion which was certainly value for your money. I had the welsh rarebit which was beautifully presented and filled me up. The Carrot and Coconut soup was delicious as was the bubble and squeak. Recommend a meal here then to go out and have a look at what plants could adorn your garden afterwards. Staff were all so friendly and helpful, pleasant and courteous and made you feel extra especially welcome. Will visit again soon. M.M. Fabulous garden centre, one of the loveliest I have visited. S.T. Beautiful garden, very spiritual, felt as if we had been to a spa, so relaxed were we. J.G. We as a staff at Cranborne Middle School decided to book the cafe as an evening venue, as we wanted something local and more intimate for our Christmas meal this year. We were certainly not disappointed. From the festive ambience of the beautifully decorated cafe, to the gorgeous food, to the friendliness and professionalism of the staff, it really was a perfect evening. From a group of very tired but extremely grateful school teachers and staff - we thank you. We will be back! C.L.